Universal multi headlamp 12v auto bulb kit. Suitable for vehicles fitted with H1, H4 or H7 headlamp bulbs. Includes 3 headlamp bulbs, 12 additional interior/exterior bulbs, 4 blade fuses transferable from vehicle to vehicle. Even in daylight, a faulty lightbulb can make your car unroadworthy in the eyes of the law. 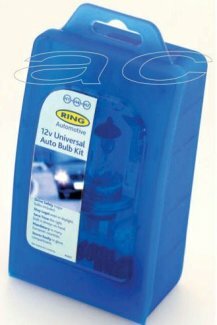 But Ring’s new 12-volt Universal Auto Bulb Kit means you will never be in that situation. It contains H1, H4 and H7 headlamp bulbs, plus 12 others for indicators and tail-lamps. These are compatible with 92 per cent of cars sold in the UK. Two spare 10-amp fuses are also included.